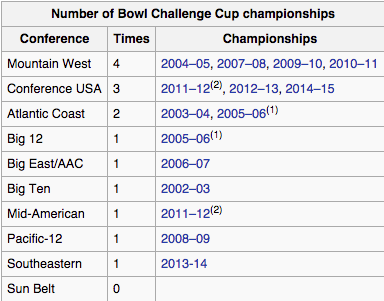 Since 2002, +ESPN has been crowning the winner of the Capital One Bowl Game Challenge. 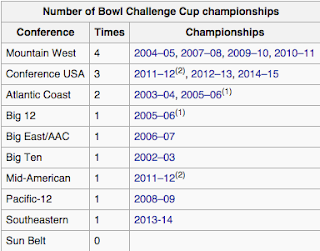 The challenge crowns the conference with the best winning percentage in Bowl Games. 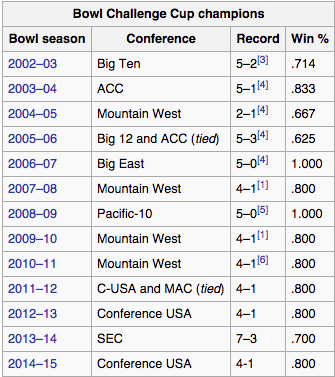 There have been 10 conferences that have been tabulated for 13 years. 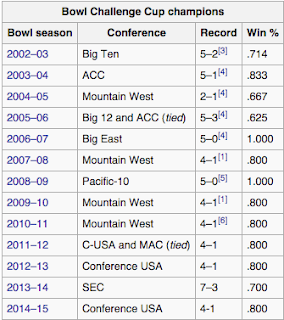 The top conferences have always been stated as the SEC, Big 10, Pac-12, ACC, and the Big 12. However, out of those teams only the ACC has won more than 1 challenge with 2 wins. The SEC, Big 10, Pac 12, and Big 12 have only one win each making them all inferior to the Mountain West, and Conference USA. The result have been posted below. What are the reasons the top conferences can't win the challenge as much as the others? I will let the excuses as answers start to flow, but if they want to win maybe they shouldn't play the competition they claim to be that strong? Can we use the phrase if we can't beat them, join them? I guess calling them the best conferences as a whole might not be appropriate. Could we just call them elite? Or the colleges with the most endowments that trickle down to the lesser every now and then? For example, Appalachian State. Could it be that they are mostly top heavy with below average depth in the conference? Let the debate begin again.